Hurricane Michael, the strongest storm to hit the US since 1969, made landfall in the Florida Panhandle on Wednesday afternoon. The Florida Pandhandle has seenhigh levels of a toxic “red tide” this year. Red tide algae has killed significant amounts of marine life, and it can cause respiratory issues among people, especially those with asthma. Some scientists say Michael will push the algae inland and expose more people to health issues. Other scientists, however, believe the red tide will die soon after going inland. With Hurricane Michael making landfall Wednesday afternoon, the Florida Panhandle is facing the possibility of additional complications from a toxic “red tide” algae bloom. The red tide has been plaguing the Gulf of Mexico since last fall, turning clean coastlines a mud-red colour and killing off wildlife. Waters on the southwest coast of Florida have been in this state for months, and the red tide has reportedly spread to the Miami area. In addition to killing marine life, the toxic algae can cause respiratory problems among people, especially those with asthma. The Florida Panhandle has already high levels of the toxic algae this year. Hurricane Michael could push the red tide inland and expose more of Florida’s population to the problem, Bloomberg reported. The health effects are hard to predict because this is the first time a severe hurricane has hit Florida amid a serious red tide, according to Bloomberg. 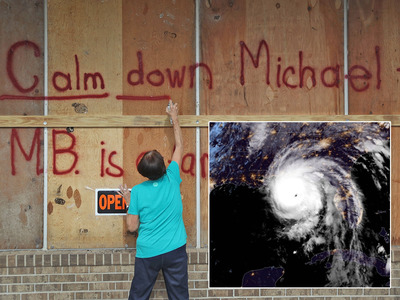 Michael is the strongest storm to hit the United States since 1969 – stronger than both Hurricanes Katrina and Andrew. It is expected to bring a storm surge of up to 14 feet in some areas. Some scientists, however, say the algae will die soon after going inland. Frank Muller-Karger, a biological oceanography professor at the University of Maryland, told Bloomberg that the red tide will lack a nutrient supply if it spreads onto land. Serge Thomas, a professor of environmental studies at Florida Gulf Coast University, told USA Today that Hurricane Michael could slow algae growth if it lowers temperatures in Florida. USA Today also reported that storm winds could end up breaking up the red tide and pulling it away from beaches.